James and Thomas had booked a session on the Wye with me for early August and soon enough the time came around. The river though had been fishing really hard over the last couple of weeks because of the low flow and high temperatures. We were hoping that the recent rain and cooler temperatures might just do the trick and improve sport. James Dad Jim also came along for a fish. We met early on the bank at 7am. The river had been high but was dropping. I think we could have missed the opportunity of them feeding. Both were very competent anglers and soon were casting to the swim on one of the cribbs on the beat. For an entire morning in near perfect conditions we didn’t have so much as a tremble on the end of the rod. No chub nothing. This was possibly the worst I had known it. We re-grouped and spent a little time in another couple of swims. These were slower and deeper. However as predicted the eels became too much of a problem and in no time we had 3. 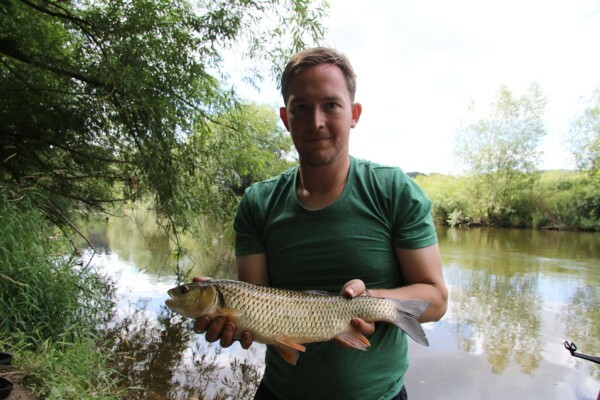 After lunch we moved to a normally great swim that produces plenty of barbel and chub. 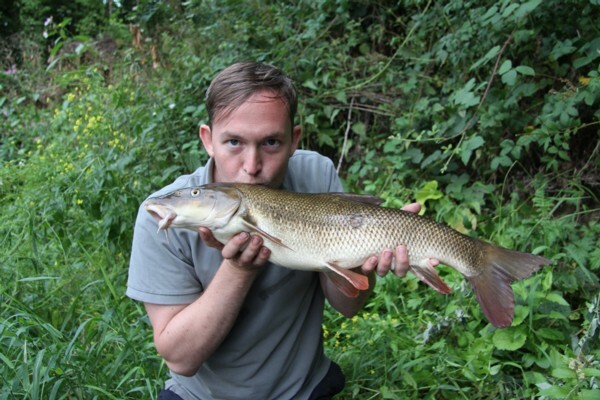 The last time it was fished 20 chub and barbel had come from it. The guy’s in the morning had fished it and lost plenty of tackle and one barbel. So things were not looking too good in the new swim. 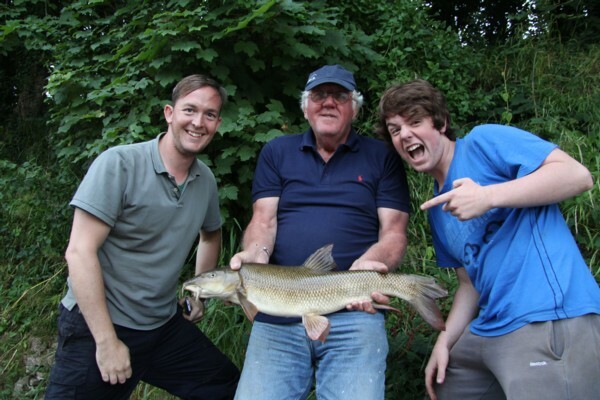 Thomas kept asking if I was confident of catching a barbel……the answer is yes. Soon we were getting some indication that fish were present with a few taps on the rod tops. Thomas was the first to get into the action. The rod arched over and he was soon playing a nice chub of 3lbs 9oz which he was pretty pleased about. 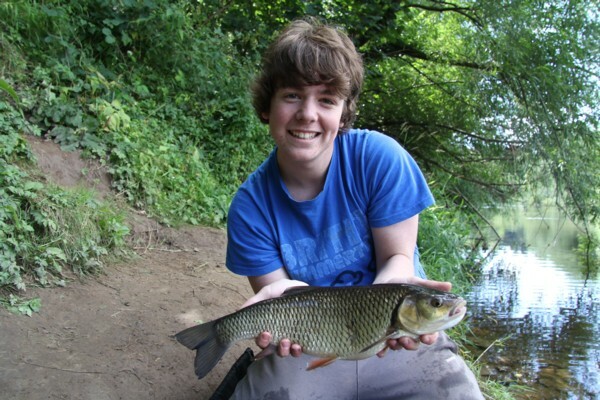 After another hour the rod arched over for James and he too had a nice chub of over 3lbs but not the size of Thomas’s. And boy didn’t Thomas tell James about it. Interesting that Thomas is going to enter a fishery management course for 3 years and I found him a really positive young man who will successed in all he does. He has for a young man a very mature attitude to life and fishing and a joy to fish with. It then went very quite and we had some fun with the canoes paddling downstream. It’s great entertainment when things are slow. Time progressed into evening and I knew that it was now or never. The rod arched over once more and Thomas was playing a barbel by the look of things, then disaster struck and the braid parted company on some sharp rocks. 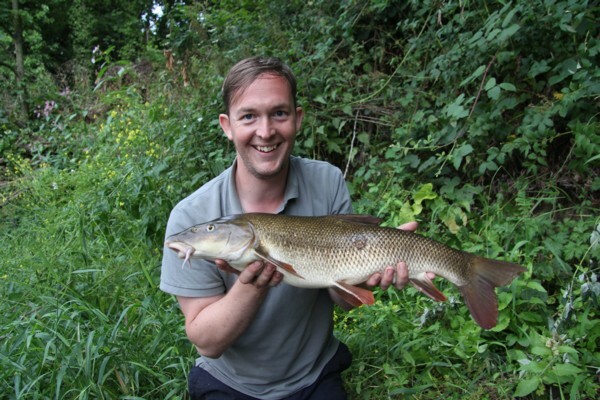 Having never failed to catch a barbel things were not looking too good. We were just packing things away as the day ended when the rod arched over and like a coiled spring James was on the rod. The strike met with solid resistance and a very good fight from a lovely barbel of 6lbs 15 oz. I Couldn’t make it 7lbs that one will need to wait. 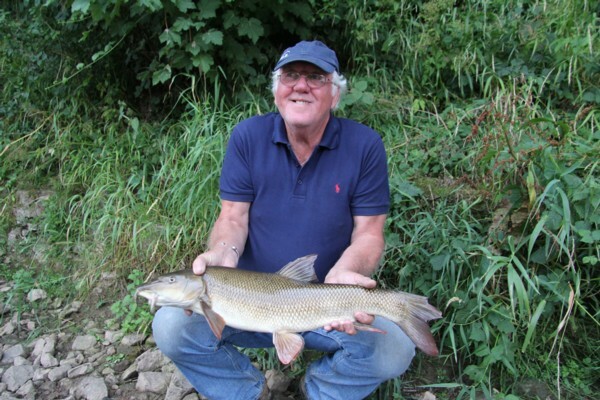 As we photo’d the fish a call from upstream indcated that Jim was too into a barbel. It looked smaller then James but on the scales it went 6lbs 14oz. So the best of the day was won by James with a ………James I should have gone to Spec savers and thanks for the extra tenner!!!!!!! I think they had fun! Got to say how much I enjoyed the day with the lads, real great guys. Thanks! The guys sent me a text saying they fished the same swim on Sunday and caught 7 barbel with the largest being 9lbs 3oz so all that coaching/guiding paid off come the end. This entry was posted on Sunday, August 4th, 2013 at 9:29 pm	and is filed under Uncategorized. You can follow any responses to this entry through the RSS 2.0 feed. Both comments and pings are currently closed.